The San Luis Obispo Parks and Recreation Department is planning for a busy spring, with three family-friendly events in April and May. The events are open to many ages and are all free to attend. Hippity Hoppity! 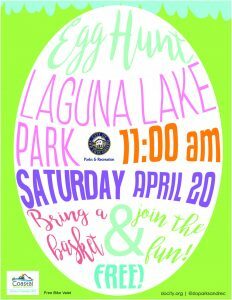 The Egg Scavenger Hunt is here on Saturday, April 20 at 11 a.m. at Laguna Lake Park. The scavenger hunt is designed for children ages 8 and younger, with three different groups: 0-2, 3-5, 6-8. The day begins with a Bunny Dance led by Mr. Bunny. Then, kids will search for thousands of prize-filled eggs (even some Golden Ticket Eggs for an extra special prize). On May 4, Parks and Recreation is teaming up with SLO Police Department for the Annual Bike Rodeo from 11 a.m. to 3 p.m. at Hawthorne Elementary School. Children will learn bike safety techniques then take a ride through “Safety Town.” The bike parade is led by police cars making it a safe and unique experience. If children don’t own a bike, they can borrow one for the day, and helmets will be provided by County of SLO Public Health. Local bike shop mechanics will be on hand for tune-ups, and helmets are checked for proper fit. Lunch is provided to participants, and the day ends with a BMX stunt show and prize giveaway. 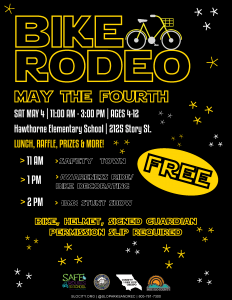 The Bike Rodeo kicks off Bike Week: “May the 4th Be with You,” in partnership with SLOCOG, Bike SLO County, and County of San Luis Obispo Public Health. Celebrate Mother’s Day with a concert on Sunday, May 12 from 1 – 4 p.m. at the Historic Jack House on 536 Marsh Street. 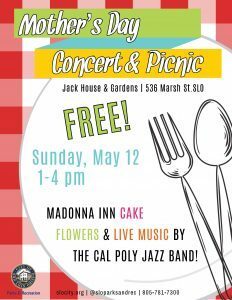 Bring a picnic and enjoy complementary Madonna Inn cake and a concert by the Cal Poly Jazz Band in the Jack House’s beautiful garden. 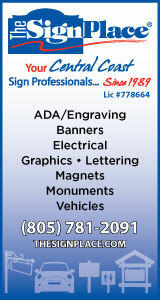 There will be a card making station and lawn games. Families are encouraged to bring chairs, blankets, and picnics. All three events are free and open to the entire public. 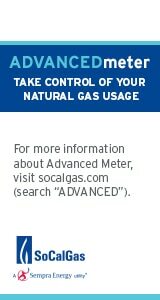 For more information, visit slocity.org/home.